During our time travelling around Australia in our trusty Ford Falcon we decided we'd look at staying a while. So while other tourists did the Harbour Bridge climb and went to the zoo we plotted a plan to find a sponsor and get jobs in Australia. R2 was safely tucked up in Queensland while we pursued this goal. After many meetings in both Sydney and Melbourne Andrew did the deal to provide us both a 4 year working visa - not an easy task by any means but he really doesn't like to do half measures. In March we drove back up to Queensland while the department of immigration did their stuff, two weeks into our stay I got a call for a telephone interview and before I knew it I was also being offered a job in Sydney. So we waited for the best weather we could, as it really wasn't the season for heading south and off we went on our cruise to Sydney. We actually left twice as the first time the wind was against us we turned back for the first time in over 12,000 nautical miles. Eventually we made it into the Sandy Straights and then onto Tin Can bay a fabulous low key holiday destination where they have dolphin feeding each morning. The weather basically gave us a few of days at a time before the next southerly hit, as we got closer and closer to Sydney the gaps seemed to get shorter and shorter although less severe. We were just docking when the first hit but Andrew did super quick parking as the wind went from 5 to 35 knots in a few seconds. The bar on the south entrance to the Sandy Straights is said to be one of the hardest, although we weren't sure why this is other than you have to turn halfway through, we had a super sail through and made it to Mooloolaba, just north of Brisbane the following night. Mooloolaba was a great spot, very upmarket with man made waterways and huge waterfront homes - the sort of place I really didn't think we'd like as it was so commercialised but it was only commercial in a Queensland kind of way and we loved it so stayed a week, swimming off the beach on the ocean side every morning and eating fabulous seafood. We decided to skip Brisi as we'd been there before and went outside of Moreton Island heading towards Yamba or Southport depending on how long the weather gave us. Late the next evening we decided to round cape Byron and push onto Yamba, this was quite a night, the weather forecasters got it wrong and we had really tough conditions which the died the next morning as we approached the coast again. We found ourselves drifting becalmed with dolphins swimming all around us while we waited for the tide to enter the Clarence river. Yamba was a real outpost, we met the kindest and strangest people here, drank beers with fishermen in neighbouring Iluka, got lifts around town in the back of a van and got told off by NSW maritime for venturing too far from our yacht in our tender. Coffs Harbour was our next stop after another beating and even more dramatic parking by Andrew as the wind whipped accross the marina - after no marina berthing for years he was now getting quite good. Luckily two fellas who had followed us from Yamba in a tinnie (approx 5m tin dinghy with no protection) were there to take our lines. Next morning the same pair returned to find their boat sunk, we got out every line we had and lent them nearly all our fenders to try and get the boat to float enough to bail it, with some help from a local fisherman and none from the water police they dragged the boat to the shore and we bailed it and tried to save a little of their stuff in the end we dragged them off to the pub. It turned out to be the bilge pump syphoning back into the boat - what a shame, at least they were insured. The next night a yacht race from Sydney to Southport diverted due to bad weather, at 2am we had a load of very scared new neighbours that had been out in a gale in their lightweight Sydney Harbour boats. The weather was so bad and the marina so unprotected we couldn't bear to spend another night on board so we went off to a lovely B&B inland a little for the night, the couple that run it turned out to be would be cruisers so came down the next night to see R2 and took us out for dinner. We eventually broke free from Coffs after filling my new camera with pictures of ugly seas and grey skies. We had a fantastic trip down to Port Stephens, with the best dolphins we have seen in a long time - loads and they stayed for ages doing the biggest flips and spins. 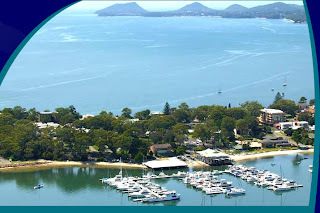 Port Stephens is one of the most beautiful spots we have taken R2 in Australia - the Coast Guard told us as we arrived that they call in Dutch country and that was a good likeness. They had free moorings we took until our friend the wind blew up and made them uncomfortable, so off we went to find a quiet anchorage. We dropped the hook and settled down to make lunch, then we saw smoke! As Andrew investigated found more than smoke - flames. I packed the evacuation bag then Andrew let a fire extinguisher off in the cockpit lazerette where the flames were. Gosh we were so lucky.... it turned out to be the regulator for the wind generator, it shorted out, set on fire and then burned out much of the contents of the locker including electric wires, drain hoses, GPS antenna, nav lights and fenders but just missed the gas hose. And what a mess. A bit shaken up we found a spot in the most expensive marina we have ever been to but they did bring us newspapers, coffee, cocktails, lend us a car and have marble bathrooms! We were now just over 2 hours by car to Sydney so really considered leaving R2 in this fab spot - as if you paid for 2 months it was quite reasonable. But Andrew worked hard and we cobbled things together to make the trip to Sydney. We arrived in Sydney two days later - just as the next southerly hit - typical. We therefore nipped up into the Middle Harbour to R2's new home on a mooring buoy at Cammeray Marina and left exploring the city on our boat until the next weekend.